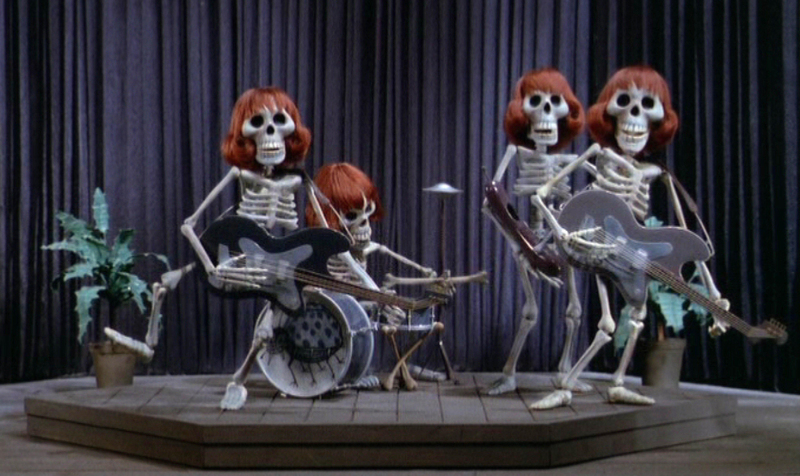 1967’s Mad Monster Party? (the question mark is official) is a Frankenstein’s monster of a kid’s movie, patched together from two wildly different brands whose heyday was the late 1960s: One is MAD Magazine, the irreverent periodical famous for comic strips and jokes and parodies, and the other is Rankin-Bass, the production house responsible for holiday perennials such as Frosty The Snowman and Rudolph, The Red-Nosed Reindeer, among other things (such as the horrifying animated version of The Hobbit). 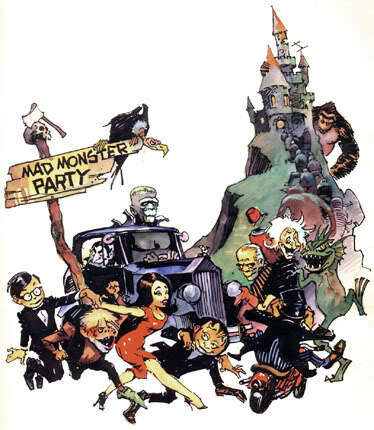 As it goes with Rankin-Bass holiday-themed features, Mad Monster Party? is a stop-motion spectacle, generally square in tone, innocent and sweet yet vaguely disturbing, loosely-plotted, and half a musical. This one is feature length, a whopping ninety-something minutes. It’s the story of Baron Boris Von Frankenstein, presiding member of the World Organization Of Monsters, who is looking to retire. He wants to leave his empire to his clumsy, good-hearted, Jimmy-Stewart-soundalike nephew Felix, and has a monster convention at his remote tropical island where he plans to make the announcement. Some of the monsters conspire to usurp Felix’s rightful place. Stuff goes haywire. The MAD sensibility is represented in the script co-written by Harvey Kurtzman, a founder of the magazine and widely acknowledged as one of the greatest American cartoonists, and in the character designs by Jack Davis, another one of the best-known MAD cartoonists. Jack Davis also did many movie posters, for films like It’s A Mad Mad Mad Mad World and National Lampoon’s Animal House (it’s his artwork that accompanies this article). 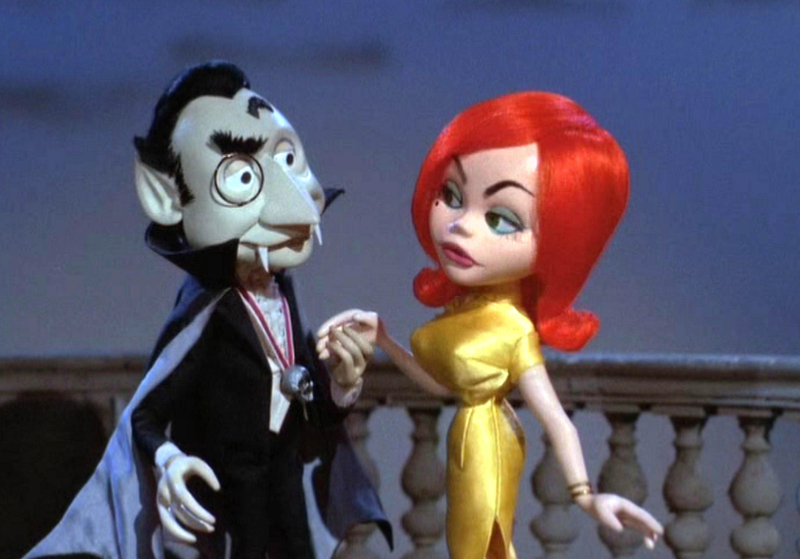 His caricature-heavy style is most apparent in Mad Monster Party?’s version of Count Dracula, who strongly resembles Grandpa Al Lewis from The Munsters, and in the designs of Baron Von Frankenstein and the Monster’s Bride, who are voiced by Boris Karloff and Phyllis Diller respectively and are drawn accordingly. Jack Davis’s style meshes comfortably with the Rankin-Bass house style, which is overall more prominent (the dotted eyes of protagonist Felix, the adorability of characters like the Hunchback and the Mummy contrasted with the surprising hideousness of the Werewolf and the Creature, etc.). I didn’t remember this one as well as I do Frosty or Rudolph. There are a few reasons for that. One is that this movie has one of the most haphazardly-structured stories I have ever seen, even for a children’s cartoon. Certain scenes go on way too long, certain plot digressions are highly unnecessary, and the musical numbers are generally jarringly at odds with the themes and tone of the rest of the story. 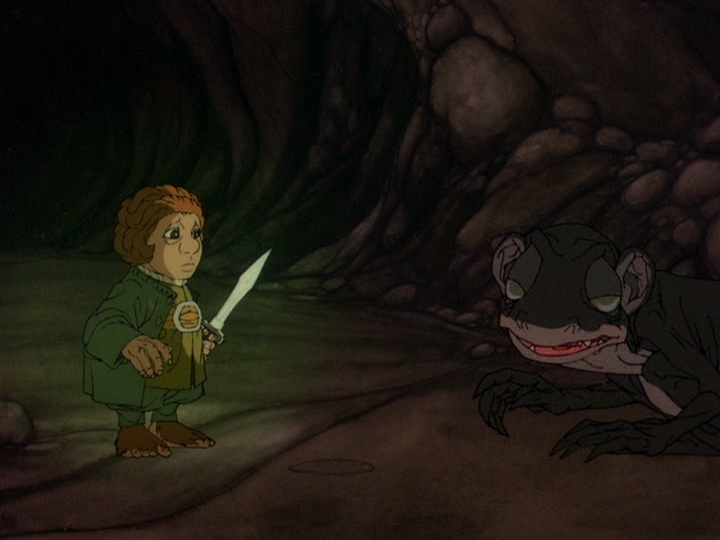 The pace of the movie is bizarre, although that’s in keeping with most of Rankin-Bass. Probably due to the MAD influence (particularly that of Kurtzman, the Little Annie Fanny co-creator), the movie is a little too horny. The characters drop more than a few risqué double-entendres and other weird Frenchisms. And lastly, the ending is astoundingly unusual – although if I reveal it here you’ll only want to see it more – the story ends with the extinction murder of all of the monsters, with the last two surviving characters marooned in a lifeboat. Then one of them reveals her inevitable, imminent death to the other. 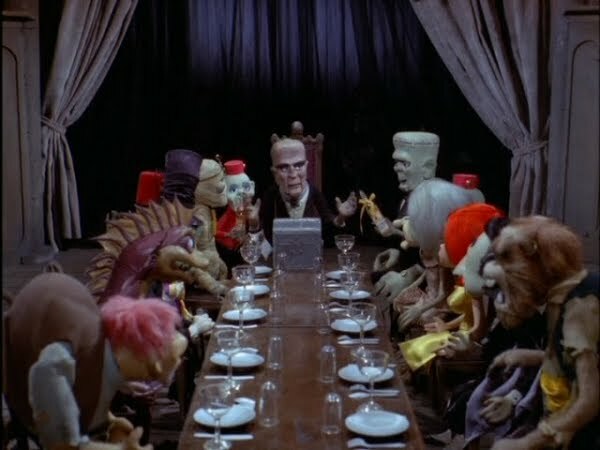 I have to say, the weirdness of it all only served to make me fonder of Mad Monster Party? But I admit to having a somewhat skewed sensibility, as befits someone who runs a semi-regular Halloween column. Mad Monster Party? was re-released on DVD last month. You can definitely watch it with kids you love – it’s certainly safe for that – just be prepared to dodge a couple uneasy questions. It’s also corny as anything, but that helps make it lovable.